One of the more moving local Memorial Day observances is the lantern floating ceremony at Ala Moana Beach Park. Each year, thousands of kama`aina and visitors make their way to this solemn occasion of prayer and remembrance. If you have never been, it is worth your time. 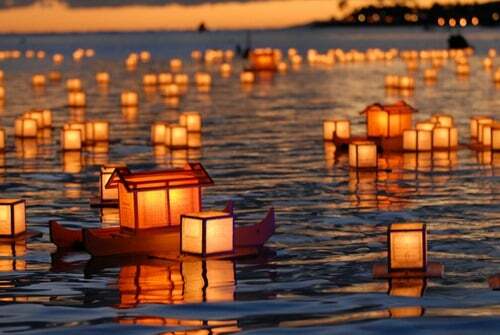 Find out more at the Lantern Floating Hawaii website. The ceremony has Buddhist roots, but people of all faiths are welcome to participate. It starts at 6 p.m. Weather permitting, it might be a good way to remember and honor a departed loved one. A glorious sunset may be an added bonus. A recent Marketwatch article titled “Retirement lessons from Pope Benedict” explored this timely issue. Whether you are the Pope, a business owner, or a CEO, there is always the question of succession. This is true in your personal life as well. It is important to have a line of succession spelled out in the event that you become unable to make or enunciate decisions regarding your assets or your health care. Whether you are responsible for millions or just a few, the take-a-way is the same - always be prepared. You and those you care about will benefit from your taking the time to focus on the "what ifs" and put appropriate measures in place. The online version of The Wall Street Journal features a very helpful article about being wise about charitable contributions to churches. Be a Doubting Thomas: look into the organizations to which you plan to contribute, and ask questions about how they manage and spend the money they receive. Provide for Family: make sure you are not putting yourself in jeopardy by giving so generously that you lose the ability to provide for yourself and your family. Do Good: look into ways to make charitable gifts that don't cost you anything. The options here range from volunteering your time to including charitable beneficiaries in your estate plan. Check here for more information about charitable planning. The U.S. Debt Ceiling was raised before the magical August 2 deadline amid great hand-wringing and "the sky is falling" rhetoric out of our nation's capitol. Despite the tireless efforts of our tireless representatives, our stock market still plunged, and global markets followed suit. It appears that our country will be saddled with a reduction in our credit rating, which raising the debt ceiling was supposed to avert. Making sense out of the baloney sandwich we have just been fed is tricky because most of us don't comprehend that in Washington DC, a budget "cut" means reducing the size of an increase in spending, rather than a reduction in spending that would result in less money going out of the public coffers this month than we spent last month. Here is another point that most of us don't understand. Our country borrows about 40% of what it spends every month, and part of what we borrow is money to service the debt on the money we have been borrowing for decades. Imagine if you tried to run your household or your business the same way. Unless you had the ability to print your own money, economic reality would soon put you in bankruptcy and/or out of business. The thing with our government, is it is big enough to keep the charade up for a very long time before it runs out of options. We are now running out of options, and we are going to have to start doing things differently if we want to survive as a nation. Raising taxes is a no-brainer for our elected representatives, seeing how half of our people do not pay taxes anyway, and most of the tax burden is shouldered by a relatively small percentage of our fellow Americans. So a tax increase offends a minority of our people, and elections are won by majorities. Thus, a tax increase looks very likely. Where will this hit Seniors? One very likely place is the estate tax. The estate tax is the tax on the privilege of owning stuff when you die. Even if you have acquired your "wealth" by earning and saving and investing and paying taxes all throughout your lifetime, the government wants a cut of your assets when you are gone. Right now, Federal law allows us a $5 million "coupon" to apply against the estate tax. In other words, if you are a U.S. resident, the first $5 million of your estate can pass to your loved ones tax-free, and $0.35 of every dollar over $5 million goes to the folks in Washington who brought us the Debt Ceiling Deal. Surely they can spend it more wisely than your loved ones would, right? If this sounds fairly inoffensive to you, wait until 2013. In 2013, your estate tax coupon goes down to $1 million, and the tax rate goes up to 55%. This is the law that is currently on the books. Congress will need to do absolutely nothing for this change to come into effect. Could Congress decrease the coupon and raise the tax rate some more? You bet. It is hard to say what the likelihood of that will be, but what seems to be growing less likely by the day is that Congress will do something to preserve the current coupon amount and tax rate ($5 million and 35%). If there is some likelihood that your estate will be worth more than $1 million when you die, and if you plan to live beyond 2012, you need to take steps now to protect your loved ones from what could be a very nasty tax increase. There are some things you can do that can put a great deal of money into the hands of your loved ones instead of the hands of Congress. The second of the government's options is to make spending cuts the way those of us who live in reality have to make them. That is, to actually spend less this year than we did last year. When the government cuts funding, it will probably try to make the cuts as "across the board" as it can in order to preserve the appearance of fairness. If every program is cut by 5%, for example, we can reduce our spending and appear to be causing everyone to bear an equal portion of the pain. But remember that Congress spends money on some of the darndest things: a "bridge to nowhere" in Alaska, scientific studies about things like whether healthy shrimp perform better on a treadmill than sick shrimp, and maintenance of buildings that are no longer in active use. Our Federal government even pays farmers not to grow certain crops, and to destroy certain clean, healthy agricultural products--you have probably seen pictures of milk being dumped down the sewers. Should fixed-income Seniors shoulder the same budget cuts as these worthy endeavors? Not in a world where sanity prevails, but I digress. If you are a Senior, be prepared to tighten your belt. Some more. The third option is to raise taxes and make real spending cuts, which is sounding like more and more of a probability. So not only do we have to look for ways to protect what we have, we need to be ready to surrender more of it to the people who got us into this pickle in the first place. At this point, you are probably not feeling particularly grateful for being given a preview to such a bleak but plausible future. However, there is room for optimism. First of all, we the people of the United States of America are remarkably resilient and able to tackle big problems (World War II, for example). We have a history of pulling together when we need to in order to overcome daunting odds. Can we do it this time? Well we really don't have a choice, do we? Faith, creativity, entrepreneurship, resolve, and self-sacrifice are going to need to see us through the next couple of decades. Second, we have the ability to tell our elected representatives what to do. They don't always do what we ask, but we are at the point where our survival depends on making sure our representatives are either working for our best interests or are pursuing some other line of work. We overwhelmingly outnumber our representatives, so we need to make our voices heard and our votes count. Finally, our country, like it or not, has been blessed by our Creator in undeniably incredible ways. Whether you believe in a Creator or not, the people who founded our country and gave us the tools to be able to govern ourselves, were deeply religious men and women who saw themselves as servants of a good and gracious God. As in past generations, people of faith, people who see a bigger picture than their own personal self-interest, will step forward and encourage our neighborhoods, as well as our nation's capitol, to pursue the vision that we are endowed by our Creator with certain inalienable rights: among them, life, liberty, and the pursuit of happiness. To the extent that our government does not enable these things, it is broken and needs to be fixed by way of the ballot box. And to do that, we need an electorate that is armed with the truth and the resolve to do the right things.